South Bethany Town Hall will serve as an art gallery for the next three weeks. 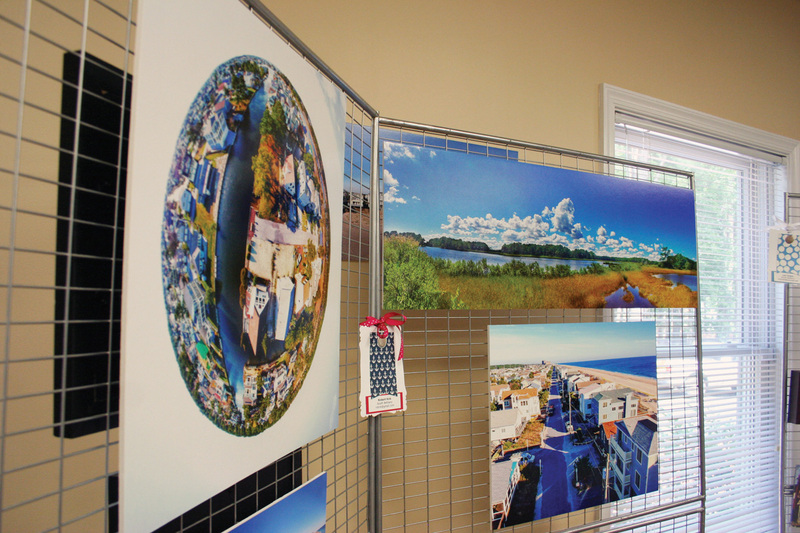 She and 20 other people have displayed that beauty in the South Bethany Art in the Hall photography exhibit, located at South Bethany Town Hall. All participants live or own property in or near the town. Images ranged from macrophotography with close-ups of a delicate coral reef to aerial views of the town from drone-captured images. There are funny and arresting photos of animals around town, such as dogs frolicking and wild deer spotted on the beach. There are also familiar scenes, including local landmarks and all-natural landscapes. It’s not just paper prints, either. Artists got creative with their media, displaying their images on metal, behind window panes and on cubic blocks. Exhibitors range from professional to hobbyists. “That’s what I think really makes this a fun and unique exhibit. It is diverse. … Avid weekend photographers or professionals or folks that just like to have fun taking pictures,” said organizer Sue Callaway. “One of them is just a recent high school graduate, and her family has a home down in this area, and she just couldn’t have been more excited,” she added. Despite the heavy rains of June 9, the exhibit’s opening reception welcomed a small crowd of neighbors and guests, Callaway said, and the photographers enjoyed seeing each other’s perspectives. Her subjects included horseshoe crabs, sunflowers, the moon and eagles. Art in the Hall is displayed at South Bethany Town Hall, 402 Evergreen Road. The public may visit during regular business hours, Monday to Friday, 8:30 a.m. to 4:30 p.m., until July 13. The exhibition is organized by the Town’s Community Enhancement Committee and the Communications & Public Relations Committee.